I quite enjoyed Krillbite's Among the Sleep, a first-person horror-adventure played as a two-year-old boy, although it ultimately fell a bit short of my (admittedly high) hopes. The Plan was fantastic, too, albeit in an entirely different way. 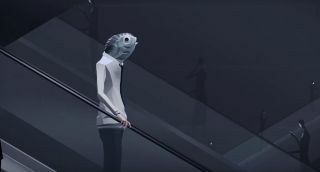 So I'm naturally very interested in the studio's next game, Mosaic, which looks like it will be another unique experience. “It's about being a small piece in this big machinery that you don't feel anything for,” Krillbite artist Bjørnar Frøyse told Polygon at GDC. Eventually, you start to feel like you don't fit in anymore—and then strange things start to happen. The studio has been very coy about the project so far, revealing only a couple of highly-stylized teasers and some hints about “urban isolation.” Even the newest trailer, while relatively long at 1:18, doesn't really reveal anything about the game. Or does it? The website at themosaicgame.com doesn't offer much but the promise of a coming teaser and a link to sign up for a mailing list, but as a sharp-eyed Redditor noticed, appending “/login” to the URL leads to a login page—the same one seen at the end of the video. Furthermore, the employee ID entered in the trailer (978-0674430006) is the ISBN for Thomas Piketty's book Capital in the Twenty-First Century, a long-term examination of the inequality of wealth distribution in the US and Europe. Where it goes from there is anybody's guess: Another Redditor says the source code on the Mosaic login site indicates that the mystery is currently not solvable at all. Hard to imagine that something so tantalizing wouldn't ultimately lead somewhere, though, and Krillbite itself suggested that there's something going on under the hood when it tweeted a link to the Reddit thread above and wrote, "Have [sic] the mystery started to unravel?" I've reached out to Krillbite to find out more about what's going on. In the meantime, if you get any more of this figured out, let us know in the comments. Update: It's not much to go on, but Krillbite has confirmed that there is some ARG action at work here. "Since everything will evolve while we develop the game in the coming year, we won't give away much, but it will be linked to the themes of the game, like urban isolation, and capitalism, like the ISBN showed now," a rep said. "The story is about a person stuck in a dreadfully boring everyday life, and we know a lot of people can relate, and that is why we want to merge in ARG elements."